Business and the Artist. | Frank. 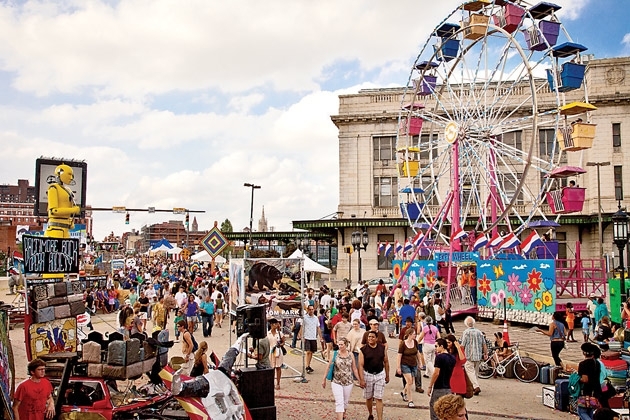 Every year in the sweltering heat of mid-July the city of Baltimore hosts a giant love fest for the creative arts called ArtScape. With the venerable Maryland Institute College of Art looming over all, thousands of festival goers traverse the steaming streets of Bolton Hill where various ‘booths’ are set up to sell everything from barbecued meats to hand-crafted glass figurines. This year, as we went from booth to booth, examining the paintings, posters, pottery, and other creations, we couldn’t help but think about the nature of art and its changing place in the business world. As a marketing firm we do not sell art. We create art that sells. In that way our motivations are vastly different than the fine artist who fashions his products to express his emotions or worldview. But much like the fine artist we sweat and labor over the tiniest details to create one-of-a-kind objects. That’s a stark contrast to current trends in marketing where creativity is reduced more and more to dropping stock photography into design templates. In a sense it’s anti-creative since it is more about conformity than imagination. We all know the supposed advantages of this method, chiefly ease-of-use and/or lack of expense. The goal in marketing, of course, has always been to stand out. The brands that could establish their values and show consistent traits were the ones that were ultimately successful with the public. Some, such as Coca Cola or Apple, at times, even inspired the public. These, of course, were the most successful brands. Creating new things from the ground up requires skill, hard work and much attention. But that dedication can pay off in gratifying and profitable ways. It can have a powerful positive affect on your business. One of the smallest investments you can make in your brand is in the old-fashioned printed business card. Even in this advanced age there is nothing like it when it comes to creating an immediate and lasting impression. One client we know achieved this by going backwards in time. Instead of utilizing the latest, most modernized printing methods, they chose to have their card printed on a press using raised type. This type of printing literally impresses the letters into the paper instead of merely showing an image on the surface. It creates a tactile experience that is as satisfying to touch as it is beautiful to see. When this client recently embarked on a new business meeting, the look and feel of the card dominated the early conversation. The prospect admired the creativity of the card and wanted to know more about the choices that led to such an outstanding final product. Needless to say, the prospect, much impressed, requested a proposal. The first impression the card created set the tone for the meeting and its triumphal outcome. Stories like that one never get old to us. Perhaps that’s why we obsess over things that other people may not even realize are important. We are painstaking because we want our work products to be eye-catching, memorable and worthwhile. We want others to think about our work long after they’ve encountered it. We don’t dwell on the differences between ourselves and fine artists. We admire the fine artist and strive to harness their passion but for very practical ends. We create images and impressions that must build brands, sell products, motivate memberships and inspire actions. We know there are some who are cynical about our industry. (We watch Mad Men, too.) But commercial art is an important profession. It helps companies and organizations put their best foot forward so that they can sell, employ and succeed. Commoditizing creative work, making everything pre-determined and applying it to the rigid rules of a template allows everyone to look professional if only they are all willing to look the same. And how could that possibly be good business? As ArtScape so beautifully reminded us, the key word in creative is create. In today’s business world, there is still plenty of room for the hard work of standing out.